Taking the iron door, you come to a corridor ending in a T junction, with a burial urn in front of you. The short, left corridor contains an awake Draugr and a burial urn. The right corridor descends into a room containing a leveled Draugr. In front of you as you enter the room, there is an open wooden door to a room containing another Draugr, who will be alerted by the fight. 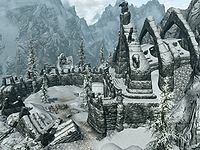 The second Draugr's room contain a burial urn. On the left side of the door where you first entered the leveled Draugr room, on the eastern wall, there is a discreet wooden door to a corridor with and unlocked chest and a pressure plate that activates a spike wall. On the northeast wall of the leveled Draugr room there is an iron door leading to a corridor with webbed walls. There is a slumbering Draugr on a sconce directly in front of you, before the corridor turns to the right. There is a leveled Draugr further ahead that will be alerted by the fight. Near this second Draugr there is an healing potion in a trapped plinth; removing it will activate a poison dart trap that will not stop, making it difficult to follow the corridor that bends again to the right. At the end of the corridor will be a room with a pillar with a lightning rune, three dead Draugr, a dead bandit, and two leveled Draugrs. There is another a lightning rune on the floor, near the stairs that go out of this room, on the northeastern end. Because of all this, the leveled Draugrs can be tough to battle. Descending the stairs you come to a corridor with a lying slumbering Draugr right in front of you. The corridor curves to the right, to a well-lit area with a Master locked chest, before curving to the left, where three slumbering leveled Draugrs are lying. Down the corridor there are three more slumbering Draugrs, and before the corridor curves to the left there is a pressure plate on the floor that activares a spike wall. After the curve theres is another pressure plate for the same trap, and in front of you there will be another slumbering Draugr. After a curve to the right and another to the left there will be three more slumbering Draugr, two of them leveled. Two pressure plates on the floor activates two poison dart traps, the second of them is right before an iron door. After this iron door there will be a bigger room where three leveled Draugr will emerge from sarcophages. Between the middle and right sarcophages, on a well-lit raised area, there is an unlocked chest that contains the key to the well cage, as well as some other loot. Looking to the left at the top of the wooden stairs opposite the middle sarcophagi on the central southeastern pillar you can see an unlocked chest that can be reached using Whirlwind Sprint. Once you gain access to the well, you can swim through it and reach a cave area with some skeevers and the corpse of a frostbite spider. This area contains a quicksilver ore vein between two large webs at the top of the ramp, with a gold ore vein to its left. The next section contains a dead Draugr next to a table that contain some poison, as well as an ancient note. A copy of the Restoration skill book The Exodus can be found in the bookcase to your right.